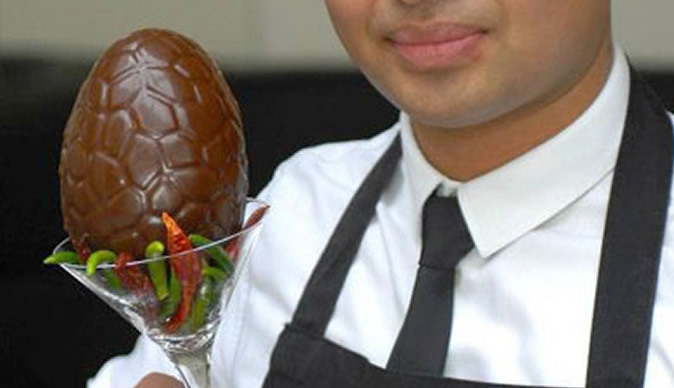 The world's hottest chocolate Easter egg - equal to 400 bottles of Tabasco sauce - has gone on sale at √Ç¬£49.95. The egg registers a volcanic 1 million on the Scoville scale - the measure used to rank chilli heat. An Indian restaurant in Warlingham, Surrey, has used fiery ghost chilli, Scotch bonnet and habanero chillies to produce the spicy egg, along with luxury Belgian chocolate. There has even been a legal disclaimer put on the egg to prove the buyer is over the age of 18 and of "sound mind and judgement". The 'Not for Bunnies' egg, produced by India Dining, is so hot diners who attempt to eat it must wear gloves. Restaurant owner Asad Khan said: "It's a rather unconventional Easter treat, but the eggs are, in fact, delicious. "When you put the chocolate in your mouth, you have the initial impact of the sweet chocolate sensation. "Then the after effect of the chilli kicks in and it is very, very hot, you do get a nice fiery sensation. "It may be a little ambitious to finish it in one go."